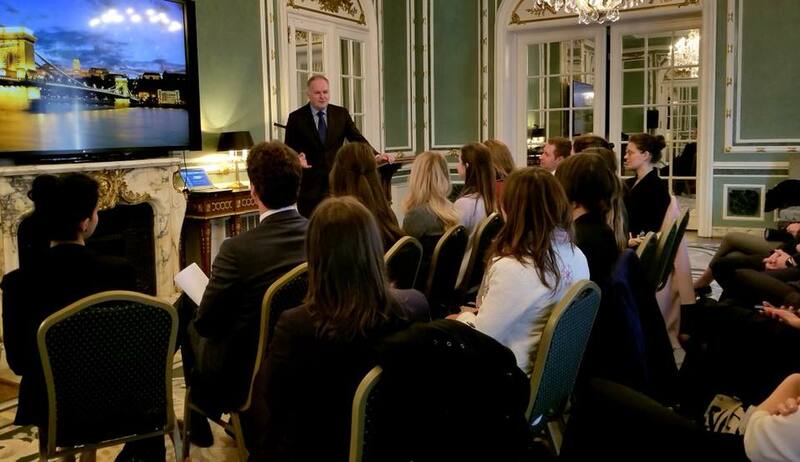 On Thursday, April 5, the Embassy of Hungary hosted a group of talented young Hungarians as part of the Hungary Initiatives Foundation’s Young Hungarian Leaders Program. Ambassador László Szabó, MD welcomed the guests and provided an overview of the main objectives of the Embassy, its most important activities and greatest challenges. Our diplomat colleagues gave more detailed accounts of their work to provide a nuanced picture of daily life at the Embassy of Hungary in Washington DC. Zsófia Koncz and Magor Ernyei spoke about bilateral political relations, including cooperation with the U.S. Department of State and Congress. Krisztián Janzsó introduced the work of the Embassy’s economic section, and Péter Gyombolai spoke about the Embassy’s work with the Hungarian Diaspora. The formal program ended with a Q&A session, which was followed by a reception and informal networking.